Chelsie from Hey There, Chelsie created a super fun and quick giraffe makeup tutorial - so cute and easy to use every day makeup for! Jasmine from Jasmine Maria put together a ton of fun Halloween looks - from a wicked spider web look and possibly THE prettiest look I've ever seen for Halloween; mermaid makeup! The colors are insanely beautiful and Jasmine did such an amazing job with this - starfish and all! This comic book character/pop art makeup look is SO different and I love the idea of it! This tutorial video from Promise Phan is so fun to watch and even more fun to create. Dancing with the Stars: on ABC, 8 PM (EST). I LOVE this show! I watch every week and they're putting on a fun Halloween themed episode for tonight's dances. The props, background dancers and costumes are going to be insanely awesome and so fun to see! Halloween Baking Championship: on Food Network, 9 PM (EST). Does anyone else love watching baking shows and challenges?! I used to love Cupcake Wars and Cake Boss, so this is right up my alley! If anything, it'll just make you eat more of that candy you're supposed to be saving for trick-or-treaters. ; ) RHOC: on Bravo, 9 PM (EST). I'm a total Housewives junkie, and the ladies of the OC are my favorite. It's the season finale, so get the wine and popcorn ready! Hocus Pocus: on Freeform (better known as ABC Family), 9 PM (EST). One of the funnest Halloween movies ever! I used to watch ABC Fam while going through candy when I was younger after trick-or-treating. Such a fun and classic movie! P.S. if you're in the Halloween spirit all day long, Freeform has Halloween movies throughout the day! And if you're one of those people who wants to skip it all together, Hallmark is starting to air Christmas movies ALL. DAY. LONG. I personally would of waited until the calendar strikes November... But to each their own! Chocolate Covered Strawberry Ghosts - too freakin' cute and easy! These are adorable and only take 45 minutes to make. With so much fun TV on, you'll need a good trail mix snack; this snack mix is every bit of sweet and salty that you need! Last week, I made these super delicious chocolate covered apple treats and while they're perfect for all season long, they're so easy to make that having them on hand for Halloween is so simple! They take all of 20 minutes to make and they're SO freakin' delicious. Rice krispie treat pumpkins - need I say more? So adorable, so delicious, so Halloween-perfect! Oh my goodness, Halloween ghost s'mores?! I'm obsessed, these are too cute! And with these fun, yummy snacks you need a fun drink to enjoy #obvi - this Hallo-wine Sangria (get it?!) is SO GOOD. I made it for a Halloween party this weekend, and you bet I'll be having to today too. Still need to decorate your pumpkins? Have some extra time and want to do something fun with your extra pumpkins? Check out how cute these fun sayings are for pumpkins! What are you doing today? I'd love to hear about your fun Halloween ideas! We had a Halloween potluck at my work and decorated pumpkins and watched Hocus Pocus! Then tonight I'm watching DWTS with my friend. I might do some creepy makeup just to creepy her out! These are such cute ideas!!! I love watch halloween baking wars!!! It is so good! 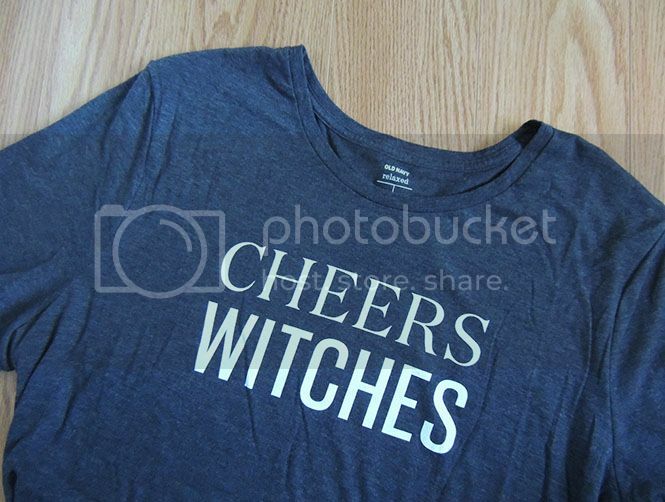 Cheers, Witches is the BEST shirt ever. It's funny to adults, and the kids have no idea. First off, I need that shirt... all year long. I'm on trick or treating duty this year so I'll be out and about! I get so excited for Halloween and seeing all the little ones in costume! Loved this post so much, especially the fact that you shared when Hocus Pocus is coming on! I'll be watching Halmark movies! So ready for Christmas time! These are all such great ideas! I'll be staying in tonight since I was basically celebrating Halloween all weekend with friends. I'll definitely be watching Hocus Pocus, it's my favorite Halloween movie! This is an awesome post! I thought I was going to be staying in tonight to watch DWTS, but I ended up taking my nieces trick or treating! 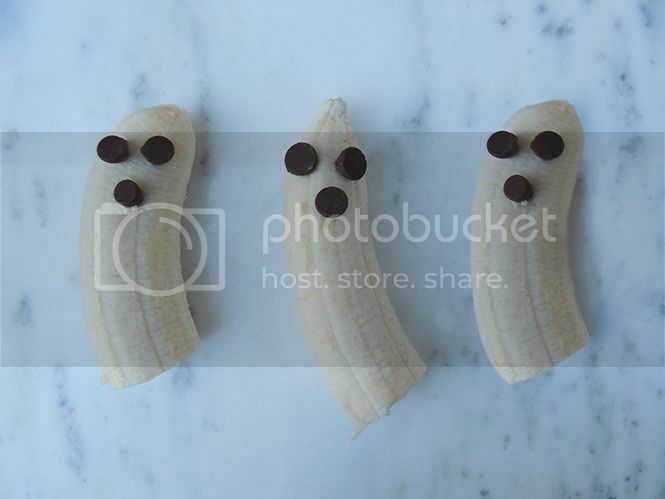 I love the yummy and extremely cute banana ghost! I hope you had a great Halloween! This is an awesome Halloween list that you've put together. I love how Halloween these days isn't just for kids. My friends and I do yearly Halloween Horror movie nights. Great post! I've always hated the fact that we don't do Halloween here, that I never knew there were so many things to do even without parties and stuff. A Halloween Baking Competition sound amazing!! These are some awesome last minute Halloween ideas. 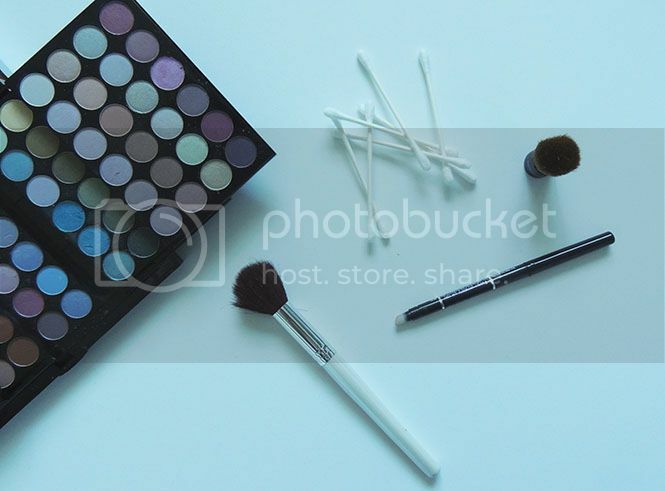 I just through some blue glitter eye shadow on my eye lids. My pumpkin didn't get carved til Halloween day. Thanks for sharing the snacks and other ideas. These are super cute ideas. Anything last minute is perfect for me. I love adding last minute touches and new ideas to parties and more. These are awesome! I'm not that into Halloween, but enjoy "celebrating" with treats & Candy! This does sound like a great way to celebrate. We went trick or treating and my mom and I dressed up as well. It was fun. I love that T shirt. I sat outside dressed as an Owl and handed out candy to all the cute little kids. I didn't dress up yesterday. In fact, it has been a while since I have worn a Halloween costume. I took my youngest trick or treating around the neighborhood. He was funny and kept saying that it was the best Halloween ever or that he was nervous to go up to a "spooky" looking house. Silly boy. Great ideas for planning a last minute Halloween fun! I LOVE that shirt! That's been my favorite saying this Halloween along with 'Witch Better Have My Candy' they're too funny! This is all so cute. I almost bought that Witches shirt at Target last week. I'm so sad Halloween is over! Great round up! I'm sad that halloween season is over! Obsessed with Hocus Pocus. seriously! :) I love this! These are great ideas and I have to say that the bananas are my favorite. I'm trying to think of a way to turn them into turkeys for Thanksgiving, lol. Such fun ideas! I didn't really do much for Halloween because I had an exam the next day... will keep these in mind for next year! I wore my Jack Skelington onsie and just a Little fun make-up. IT WAS a good night. Awesome last minute ideas. Hubby loooves watching the movies but I am a bit of a scary cat so I prefer checking out people's costume ideas. OMG I NEED that shirt!! SO cute! Love these ideas! I definitely would have loved to watch Hocus Pocus in bed all Halloweekend!! These are great ideas! I'm loving that shirt and Hocus Pocus is definitely a must. The shirt is too cute! And those bananas with chocolate chips, I love it! Such great Halloween ideas, I am pinning for next year. It has been ages since I've dressed for Halloween. I love this shirt, though! I'll have to keep something like this in mind for year. Omg so many cute Halloween ideas!!! I'm loving that witches shirt!!! So something I would wear! Cute shirt! 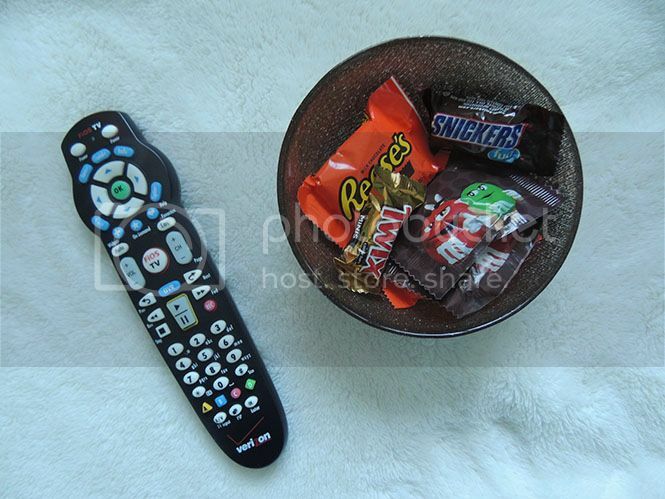 I love this post in support of everything Halloween especially the sweet treats matched with some of my favorite television programs. Good stuff! Nice post, and I love this information.